in the comments and we'll tend to them asap! Recently, Ashley and I have been on a pretty good roll! We've attended two events in the span of about two weeks wherein we got to meet and talk to bloggers ranging across Beauty and Lifestyle! Its been such an eye-opener and really such great opportunities. We are so thankful for everything. 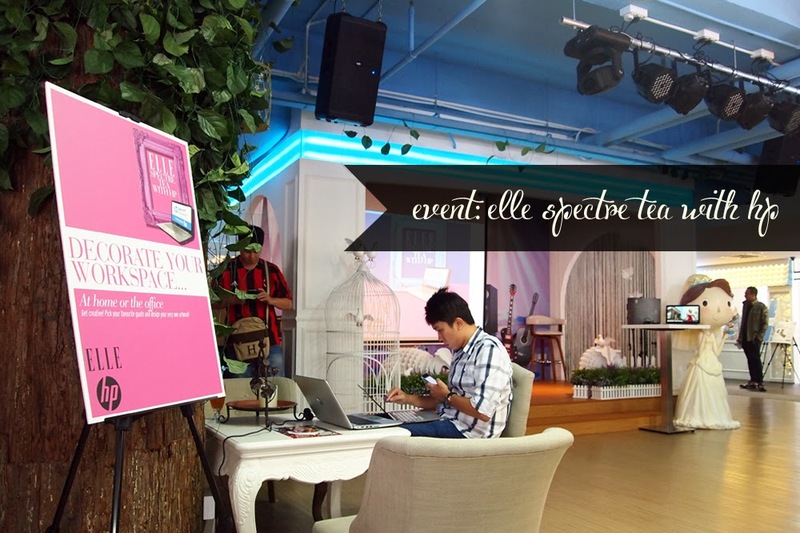 Today we'll be talking about the Elle Spectre Tea with HP event that we attended at Fullhouse Signature in Clarke Quay with four very popular beautiful bloggers. 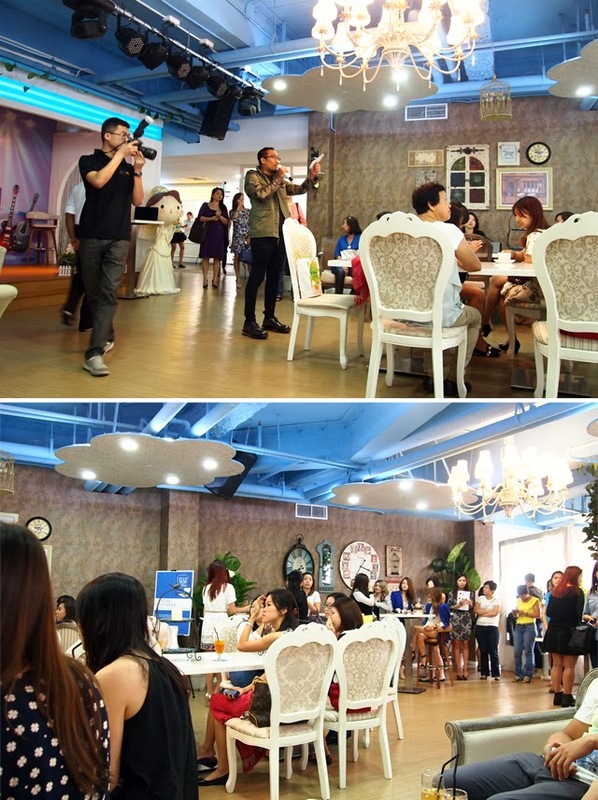 Fullhouse Signature, a casual restaurant serving all age groups, was closed for the day to host this private event. I've never been for food there before, but it appears that the location was HUGE! There were about 50+ people present and it was not even near squeezy! I also loved how the sofas and chairs all looked so plush, we all felt so much like royalty. Elle's Fashion Editor (shown above) made us feel even more welcome with interesting speech and wonderful introduction to the event. He was always so cheerful and friendly; everyone in the room felt so comfortable and at ease! Now, when I say the place was huge, I MEAN the place was huge! 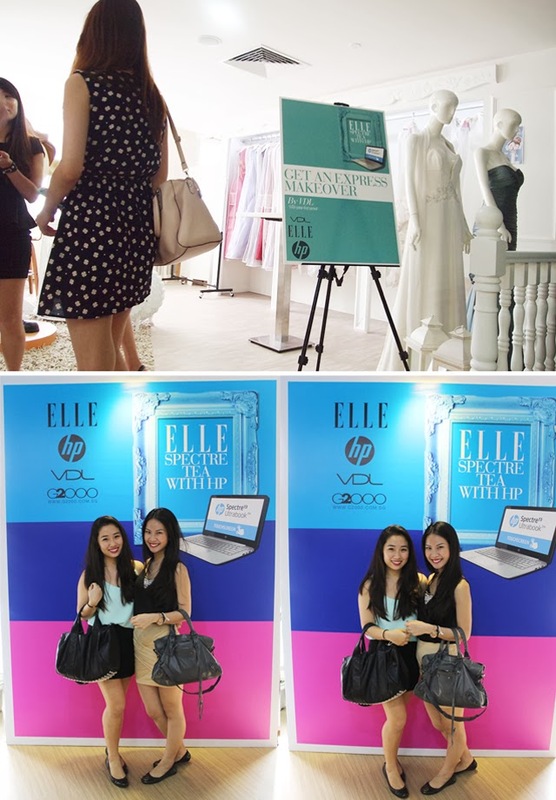 There was a special corner set aside for all us girls to get complimentary makeovers from VDL Cosmetics so they could look all dressy and beautiful for the photobooth! Ash and I had already done our own makeup at home, so we went over to take our photos first! The photobooth wasn't too big an area, but it was pretty cosy and there were props that we could use such as speech bubbles, funny wigs, large sunglasses, etc. It was so clear that everything was meticulously planned so everyone would have a fun time today! Once everyone had taken their photos at the booth, they could also create a collage (if they took a few) and get it printed as a keepsake! Very very cool. 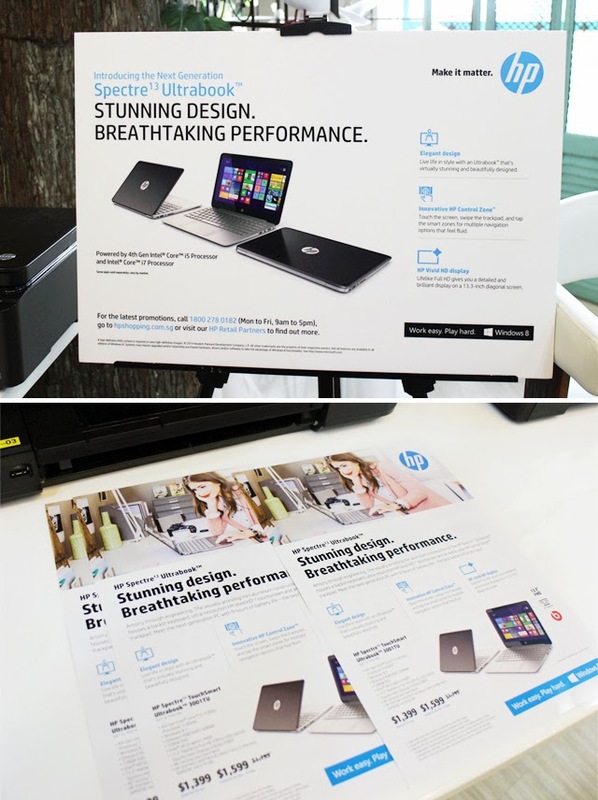 Here we go, this is the star attraction and what we all went down for - to know more about the very new HP Spectre Ultrabook! We were given a quick presentation and insight into the laptop and its many functions. We even got to play around and carry it to see how sleek and light it was. The Ultrabook is Ultra Cool because you can use the mousepad/control pad, and also manipulate through touch screen! Ash and I were just talking about how useful and convenient that would be for us to create our blog posts! Plus just LOOK at the resolution. Amazing! Those photos were taken from a recent Elle photoshoot in Rome and they looked so crisp. We were completely floored. The marketing manager, Kendrick, also talked to us about how thin the Ultrabook was, measuring at only 18mm. It comes with the Beats Audio, which we all know is one of the best in the market! The new control panels are also easy to remember and use. Truly nothing to complain about. Plus there were great deals going on today, with it costing about a good $300-400 less than the original price, and coming with a great warranty plan! So many people were excited about it, as they definitely should have been. The warranty plan was made to cover those of us who love drinking liquids near our laptops (COMPUTER SIN #1!!) and those who are just plain rough (does some inner reflection here lol). One of the activities we got to participate in today was learning how to use Adobe's Lightroom 5! It seemed very very strongly made for bloggers, lol. I know, what am I saying, it was definitely made for photographers and the like - but hey, as a blogger, it's a damned useful software I'm telling you. 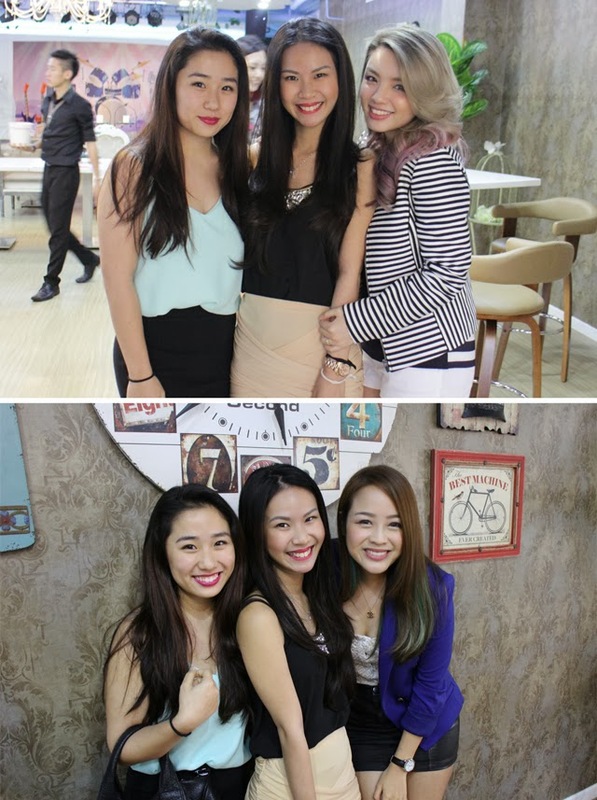 The positive side was that we got to learn different tips and tricks from our favorite bloggers! There were four today though the pictures above show Evonnz, Yina and Beatrice only. Tricia from Vain Glorious You was there as well. Needless to say.. they were all flawlessly gorgeous. The negative side was that we had to pass these beautiful women our (presumably unglamorous) selfies and watch them work their magic. There's an almost embarrassing element to this whole thing.. like showing your average naked body to a whole room of Victoria Secret models hahaha. 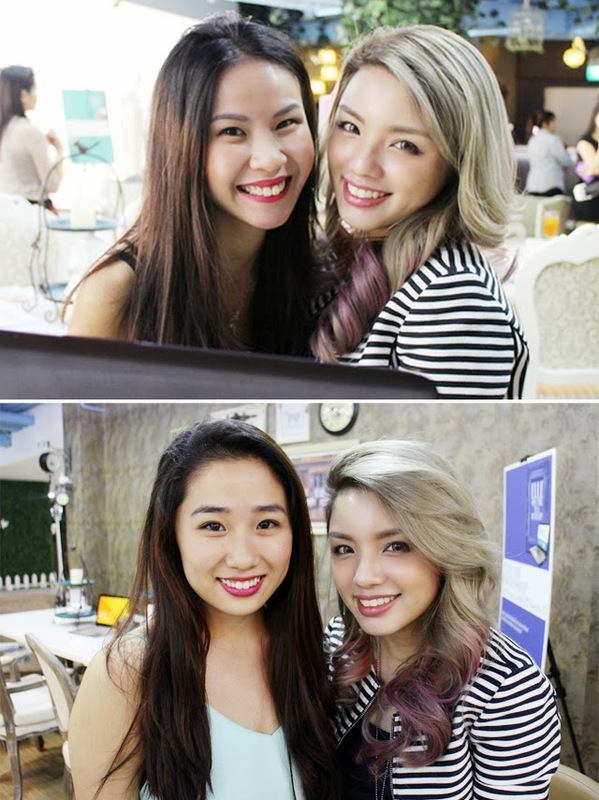 Ash and I approached Evonnz, a lovely blogger we've been following for awhile now. True to what we've heard, she's just so sweet and nice. She constantly cracked jokes with us, and was so patient with our many many questions about Lightroom. She was also extremely NOT judgmental when she saw our untouched photos and only gave us suggestions to improve them! P/S: In case you were wondering what was the whole point of the selfies and touching up.. it was that we had to each print one out and submit them to enter in a lucky draw! Since we stood a chance to win this very awesome Ultrabook, Ash and I just went for it lol. Since there were tons of girls dying to talk to Evonnz, Ash and I retreated to the food corner to have something to fill our stomachs. 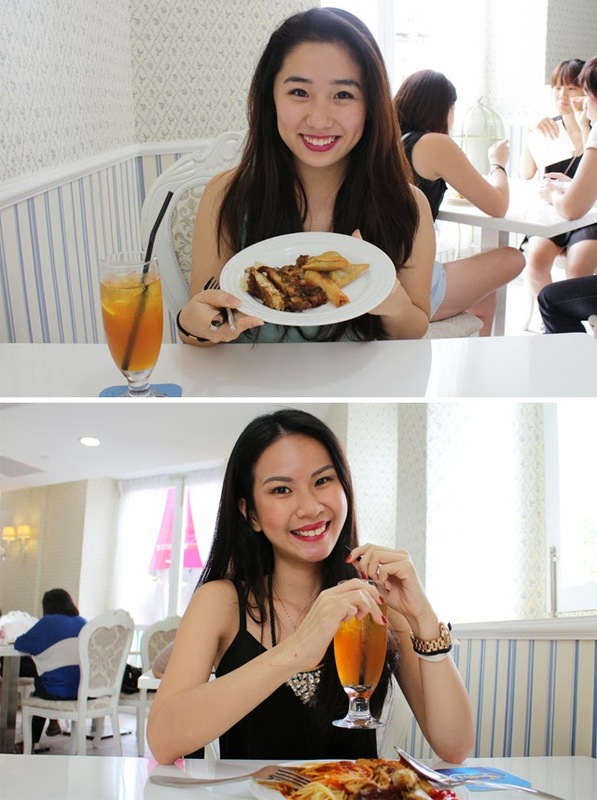 Me, being the greedy monster that I am, filled up on yummy spaghetti, some chicken chop and spring rolls (look at Ashley's near empty plate compared to mine)..... Terrible girl, I know. 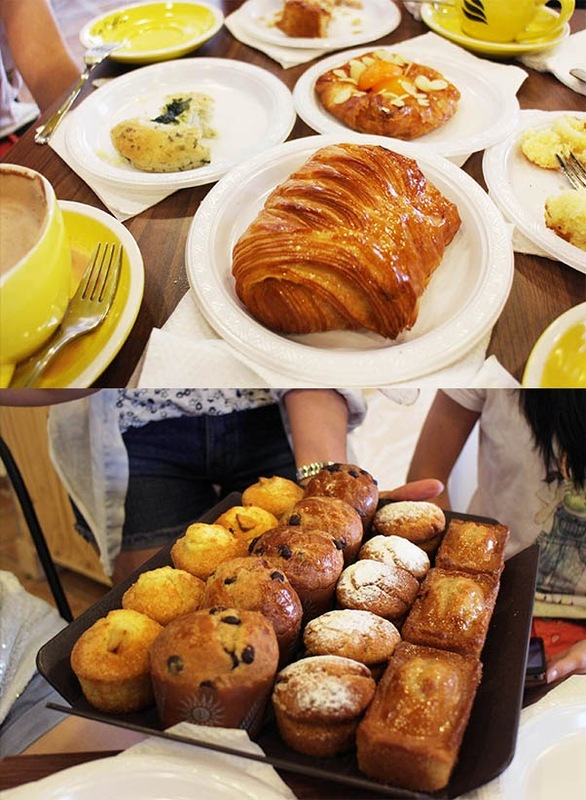 Having it all accompanied on the side with refreshing iced lemon tea was truly the cherry on top of the cream. Actually just thinking about it now is getting me a little hungry again.. I cannot be saved.. lol. There were four consolation prizes, all of which was a wireless HP speaker, and one main prize which was the Ultrabook! As you can see for yourself.. I WON THE CONSOLATION PRIZE!!! Hahahaha. I actually wasn't THAT excited because I was really hoping for the laptop.. but you know that dialect saying, "no fish, prawn also can"? Yes that was applicable. Definitely I was happy though, I mean, I actually won something! Never expected that in a million years. So as a nice touristy gesture, Ash took a photo of me and our photos to commemorate the special moment hahaha. It was great feeling and being a winner all at once! Before we left, Ash and I took some more photos and mingled with the other bloggers. I got to talk to the very pretty Yina! I know it was random.. but I could not help but ask her about her Accutane Journey! 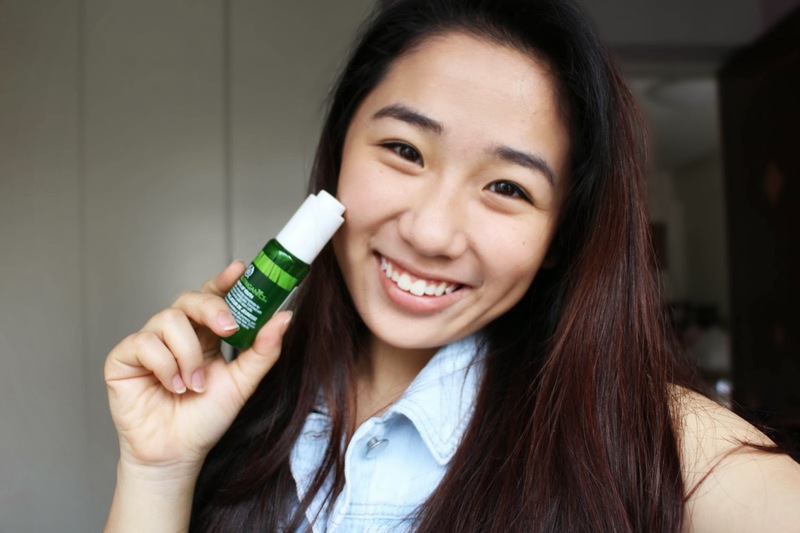 I'm always so interested when it comes to skincare (hence the beauty blogger job).. and I loved how she indulged me!! We actually talked about her breakout, how Accutane saved her, how she had to tolerate going out with the acne, etc. It was a very real conversation and I really appreciated it. Evonnz also joined in at one point and we all had a few good laughs. Do look out for our January Favorites post soon guys, we love you! Here's to a great CNY week! as you know, Ashley and I have been on the road to getting healthier this year! We've both signed up for yoga classes and are also doing the occasional zumba and pilates session! :) The holiday weight is.. afterall.. not a joke sometimes. However, as you guys know, exercise is 20% and diet is 80% when one sets on the route to being healthier and more toned. Ash and I used to be on a no/minimal carb diet for a few months last year, but we realized that just made us crave carbs more.. so we try to ration our carbs better now. Unfortunately, if there was ever a weakness when it came to the both of us... it would be *dng dng dng!!!*.. potato chips!!!! 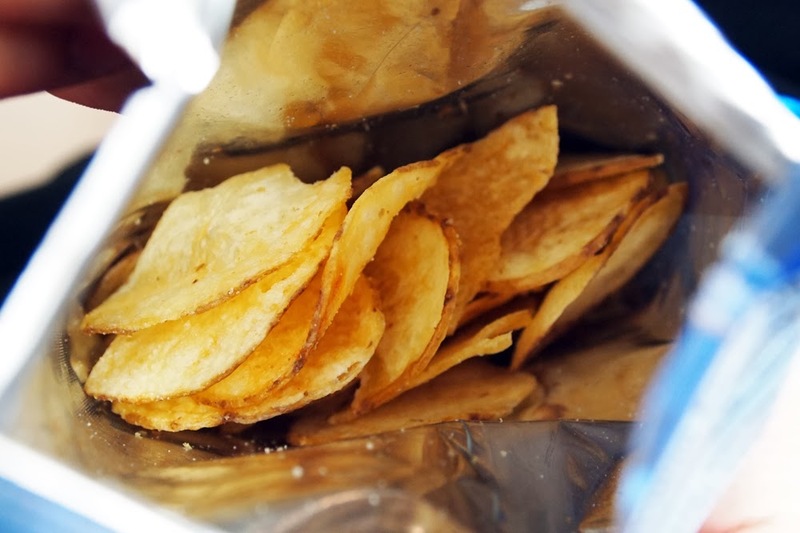 *cue overly dramatic silence* :( Thus, when we were emailed to review HEALTHY and YUMMY potato chips we were all for it! We said, "Yes send them over please!!!" 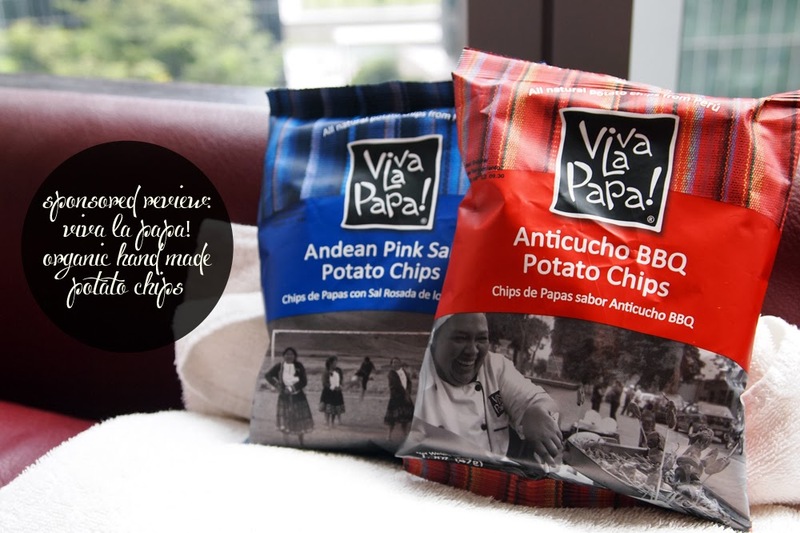 Organic Hand Cooked Crunchy Chips from Peru. Viva La Papa! selects the most delicious, sustainable varieties of native potatoes and other roots for their hand-cooked chips. The potato originated in Perú thousands of years ago, and hundreds of colorful and nutritious varieties are grown by Andean communities to this day. Alec Cousins, founder of Viva La Papa says: “On my travels to Perú I tried the most delicious food and met some extraordinary locals who were so passionate about their crops and ancient lands” continued Alec “as a foodie I was determined to work with their roots and tubers, share them with people around the world, and to help the communities whilst doing that”. Viva La Papa! 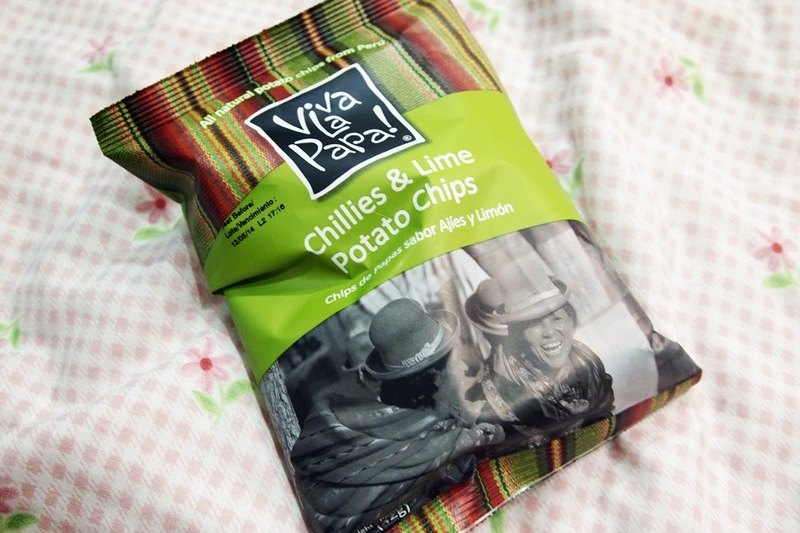 chips are presented in stunning packaging featuring classic textile colors and lively Andean locals. Cooked by hand in small batches with no artificial ingredients or GMOs, the product range is also gluten free and Kosher accredited. Viva La Papa! 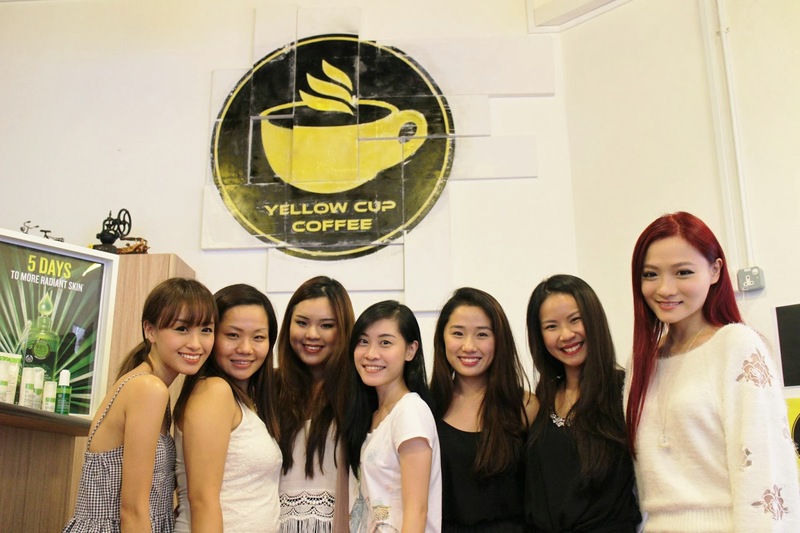 has five delicious varieties available in 142g and 42g bags through Le Bono Collection in Singapore. They are: Andean Pink Salt, Anticucho BBQ, Chillies & Lime, Exotic Sweet Potato and Native Potato. Viva La Papa! makes a contribution from each bag sold to Andean children’s charity Amantani. This wonderful organization provides schools and boarding houses for under-privileged children in remote Andean regions. Ash and I thought... hey, these are healthy chips with NO Trans Fat, NO Artificial Ingredients... why not take it to the gym? We brought the smaller packs (Andean Pink Salt and Anticuchio BBQ) with us as snacks and they served their part well! We had a break in between our Zumba class and a Bollywood Dance one (don't ask), so we just sat down to take some photos and eat some chips! 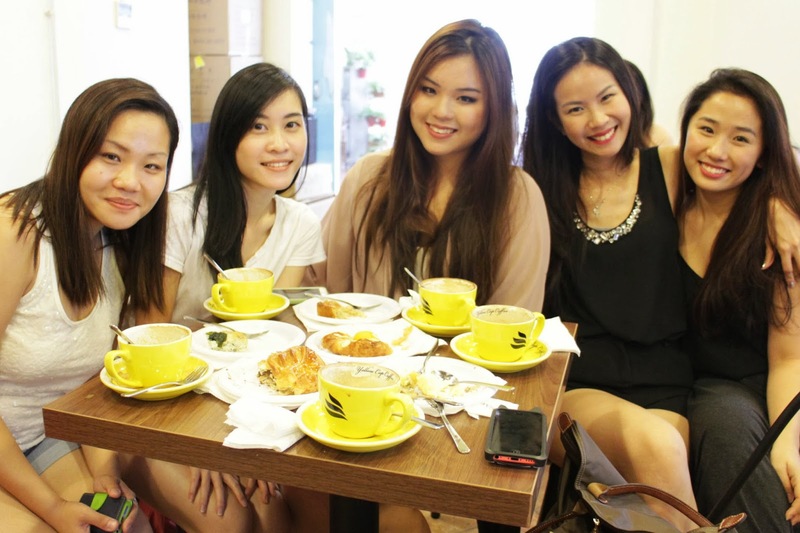 P/S: Do forgive our sweaty makeup-less faces haha!After we took the photos we laughed so hard at how unglamorous we looked. We definitely got some stares lol, what with the crunching sounds and all, but we were too busy munching the yummy chips to care! I mean, who can ignore the gorgeous crispness of the chips (as seen above)!? They were extremely tasty with just the right amount of salting! Eating them definitely filled both our bellies and happy souls up! Ash preferred the Pink Salt flavored ones as they tasted more natural and had a more authentic taste to them. I preferred the BBQ flavored ones because I like a stronger flavor and that extra zest to my chips! Besides the gym, you're also free to enjoy them in the comfort of your own room and home of course! Here is another pack of chips, the Chillies and Lime flavored one, lying in that cute little space on my bed! I know this is a cardinal sin, but I got soooooo hungry about midnight and went, "hey! What's healthier than all the Bak Kwa lying about my house?" And... my head turned towards the tiny pack of chips and... well... the next thing I know, it was all finished hahaha. I thought the Chillies and Lime one was actually pretty good and had a little kick! Though it said "Chilli", it really wasn't spicy at all. The lime felt refreshing against the spices (not spiciness) and just left me wanting more! Now... here are my favorites!!! And I'm just so lucky they came in these HUGE packs! When I opened my parcel to see them I just squealed!!! 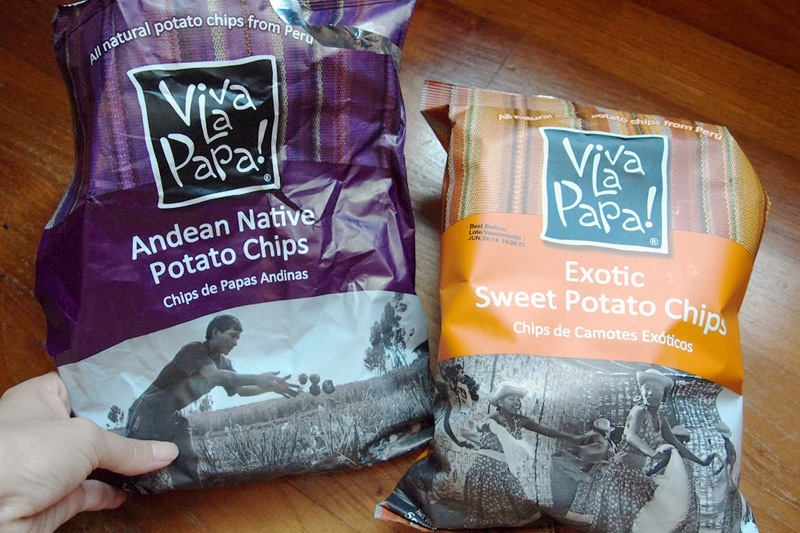 I know the Andean Native Potato Chips one is crumpled.. but it's because I couldn't hold myself back! I opened the bag up and went CHOMP CHOMP CHOMP! Once that was done (of course, I shared with family), we moved on to the Exotic Sweet Potato Chips and I FELL IN LOVE! They both tasted sooo good I could not stop myself from eating. Can you see why I loved these two so much!? Look at the richness of the colors inside! 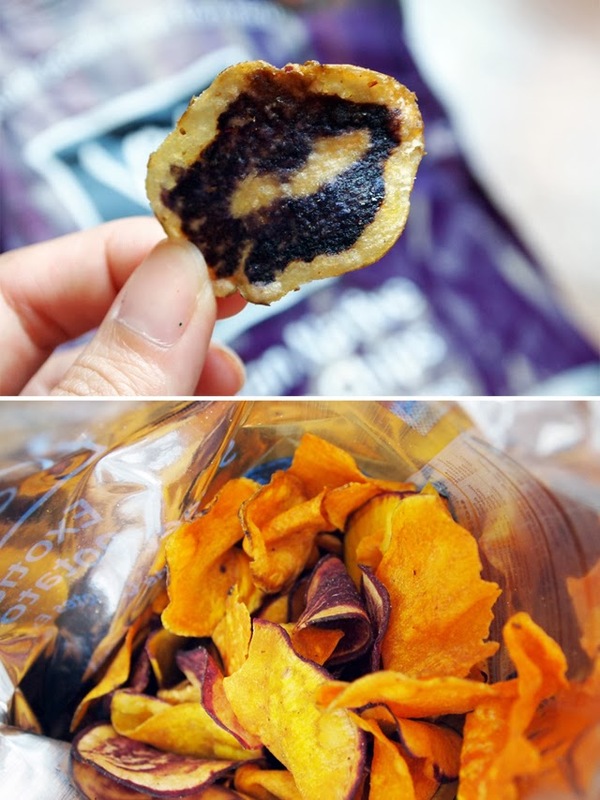 The orange-ness of the Sweet Potato Chips and the majestic purple of the Andean Native Potato Chips was so overwhelming! They already LOOKED so good, I knew the taste was going to be phenomenal as well. I liked the Andean Native ones because they were the right amount of salty and I loved how easily they went with any side dishes or drinks. It was like one of those "Original" flavored potato chips and it was almost impossible to stop. The Sweet Potato Chips were, in fact, quite sweet! The girls in my family really enjoyed them, and I thought they accompanied the Salsa dip quite well - you all have definitely got to try that combo out! What can I say? I'm addicted to these chips. They look good, taste good and are healthy! If I had my way, I'd eat them everyday (though we know too much of a good thing is always bad!). 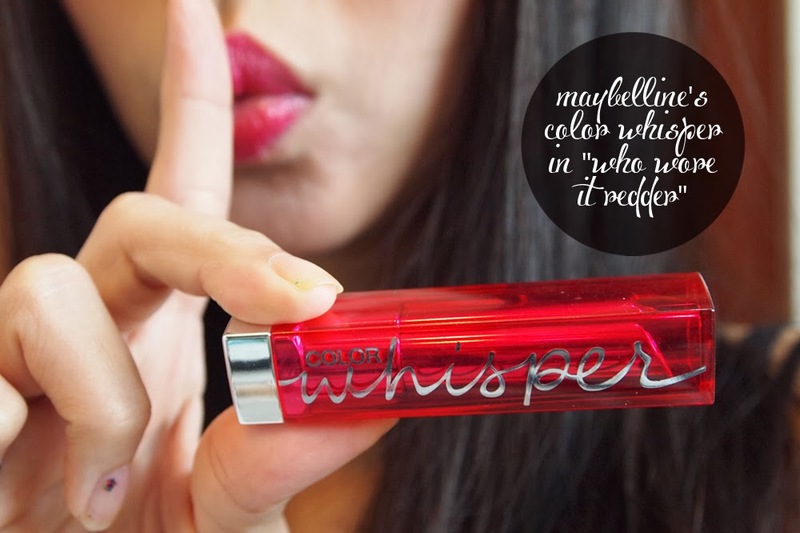 22 Senoko Way Singapore 758044.
Review: Maybelline Color Whisper in "Who Wore it Redder"
today I'm reviewing one of my favorite lipstick shades, Maybelline Color Whisper's "Who Wore it Redder"! I got this in Australia (read my post here) last year, but the reason it took so long for me to get down to posting this is because.. well.. I have about 100 shades of lipsticks lying about everywhere at home and totally forgot about this one. That was until I decided to wear it out for a date and went, "I cannot believe I forgot about this gem!" I was so impressed with it, I took photos of the product and myself all in one go before rushing out of the house to meet my boyfriend! That's how much I loved it! 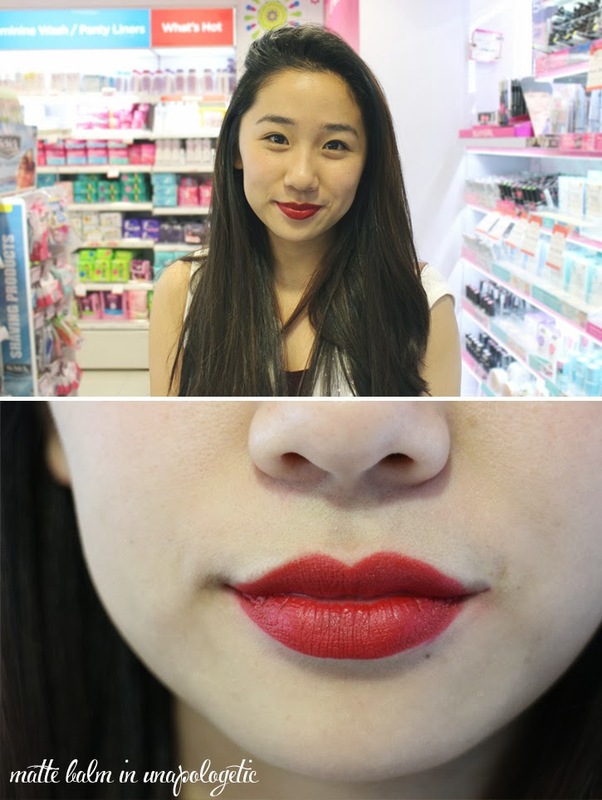 Since we do not have this lipstick available here in Singapore, I thought I'd give a little insight into it. Maybelline's website describes it as "pure color pigments suspended in a weightless gel without heavy waxes or oils". 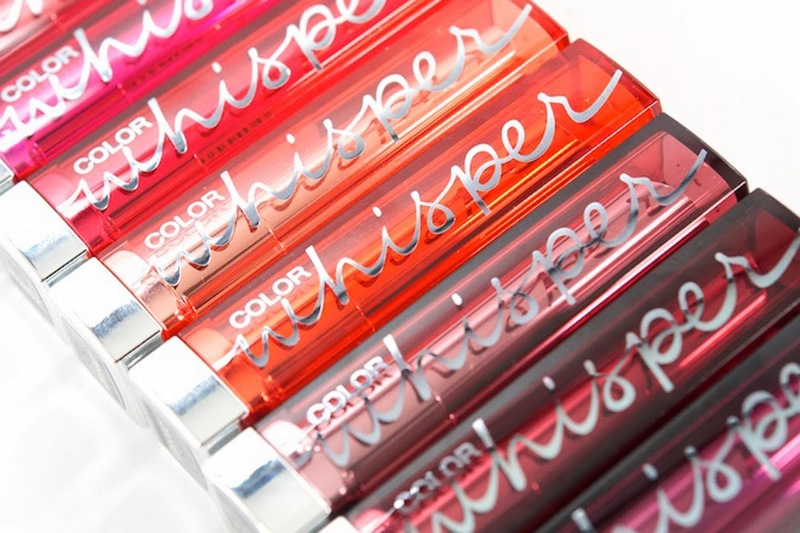 What you will get is a "truly translucent gel color" with "just a kiss of shine. There are a total of 20 shades available, and you can always purchase some shades online at Shopping-District. If you have friends living in Australia or the US, I'm sure they can get them for you too! They're very reasonably priced, at about SGD $16 each. I suppose it might be cheaper during sales. There's nothing much to say about this as it's nothing fancy. Really quite your typical tube of lipstick which you open and use! Regarding the casing (as seen in the header photo at the top), I do think it looks very sleek with the silver font against the colored background, but it's really just the graphic designer inside me talking. Most people might not even notice this. 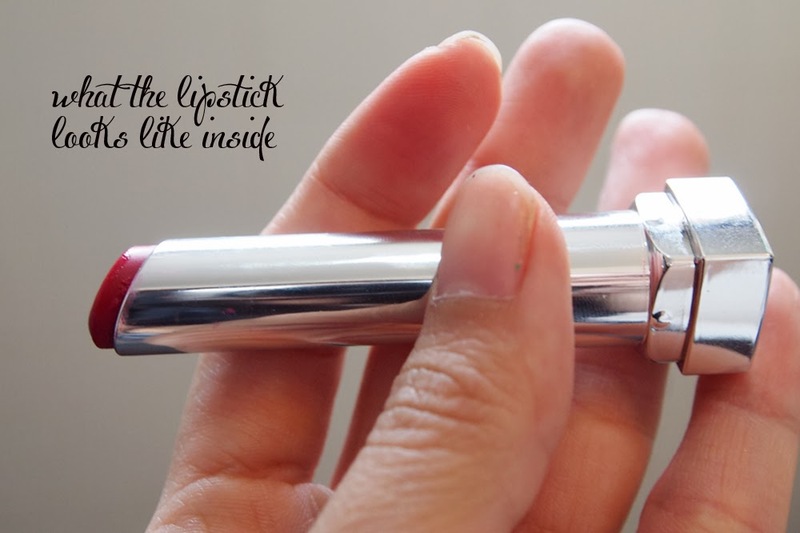 The inside is just a plain silver tube which holds the lipstick, as seen above. Even though the name of the lipstick, "Who wore it redder" suggests a very very bold red (I was thinking of Marilyn Monroe at this point), it actually isn't at all! 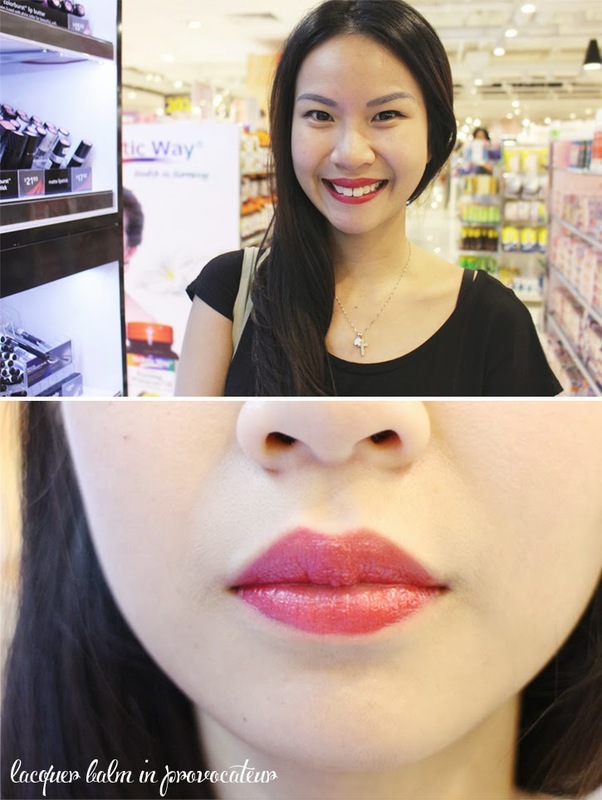 What appears on the lips instead is more of a deep rich pink mixed with a very slight tinge of red! I actually do not mind this at all because I think it looks fantastic and way more wearable for most days. I know the color looks way pigmented on me despite Maybelline calling it translucent but keep in mind that mine is quite a heavy swatch. You can always opt to go with one layer instead of three if you'd like something less outstanding. True to form, it really feels like a gel when spread across the lips. It is lightweight and so smooth; such a dream to glide it across! You will feel no dryness when it comes to this lipstick. 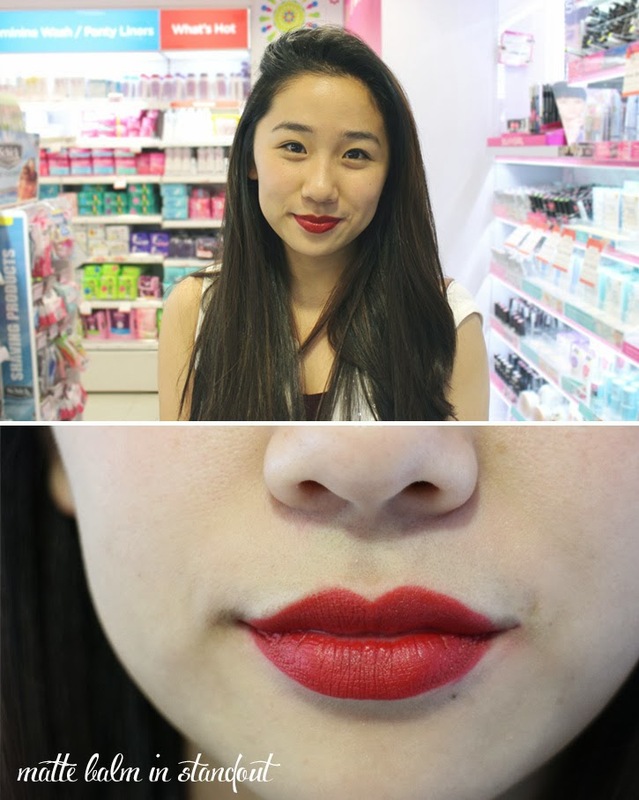 Plus, just calling it a "gel lipstick" sounds so much cooler doesn't it? It gives me that feeling of rubbing jello across my mouth haha. I did not manage to capture a photo of it after, but it wore pretty well through the day. It left a stain on my lips even after a few hours, so I suppose that's good for those who do not want to have immediate bare lips just shortly after a meal. I did find that I had to touch up after about 2-3 hours each time, which is common for most lipsticks. This one does feather a little though, and makes it quite obvious if you've layered it on more to a particular area, so do be careful about that. 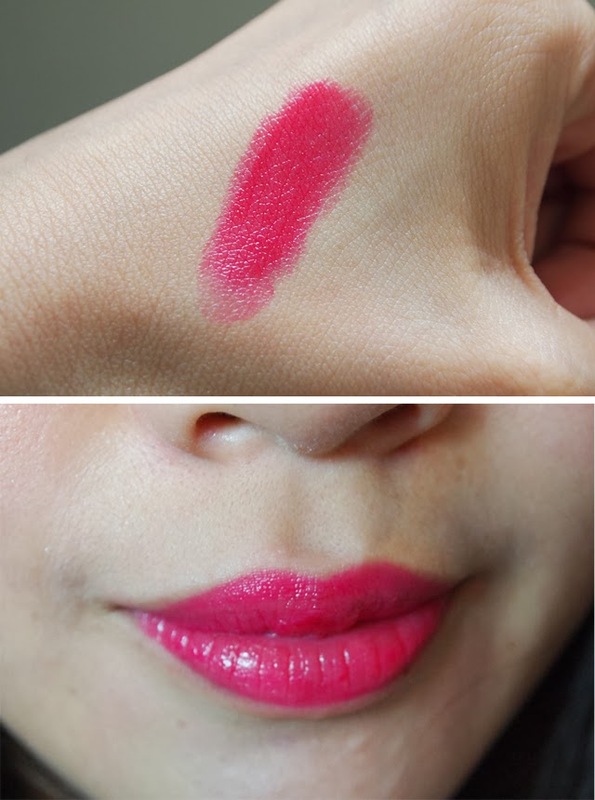 You can always use a lip brush to counter this, or simply dab it on lightly so the color is more even. I really love this color for days that I need to dress up a more monotonous dress code. Whenever I pair this up with say, a simple black shift dress or a white top/black jeans combo, everything just magically comes together. I understand that touching-up is all part and parcel of lipstick wearing so I've no gripes about that. 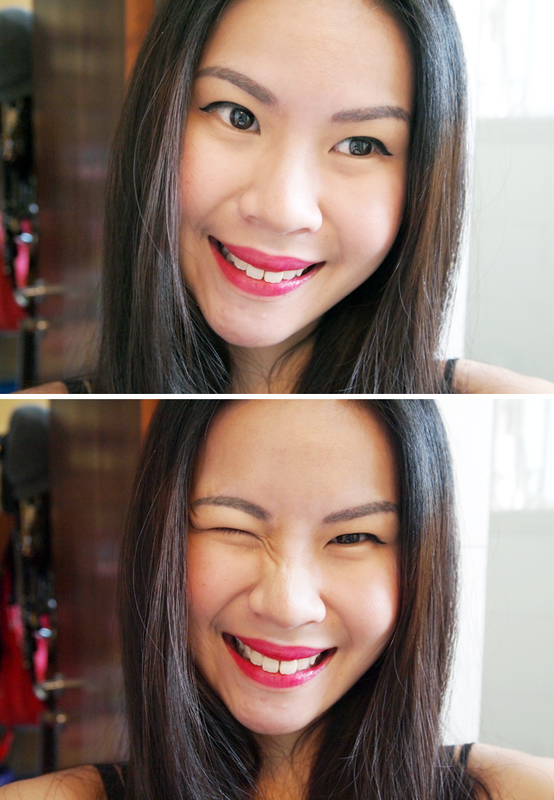 As far as I'm concerned, this is and will always be one of my favorite go-to lippies! 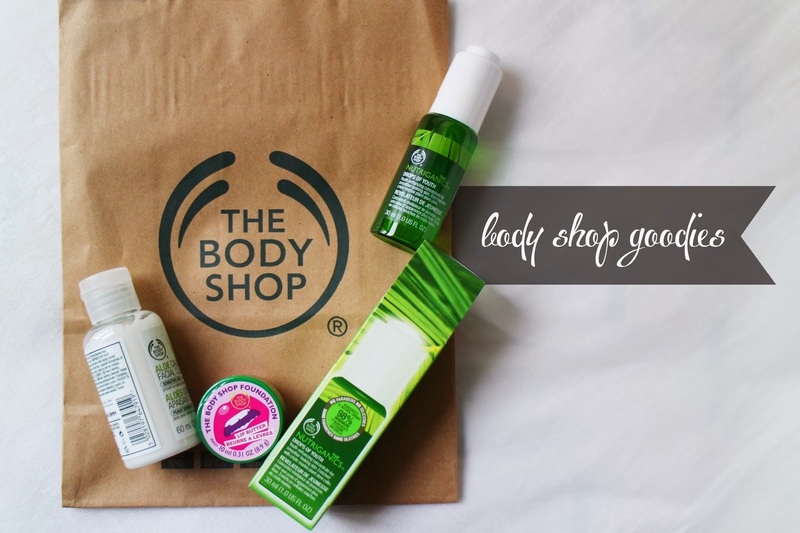 We recently attended a body shop event which you can read about here and we thought since we had two goodie bags, we'd giveaway one to our lovely readers as a little thank you for your support. 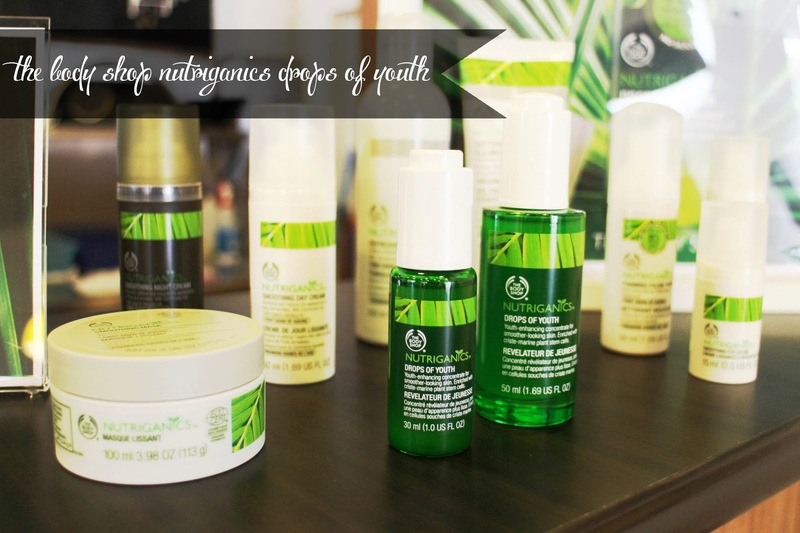 As the Body shop Nutriganics drops of youth was the key focus of the event, here's a little introduction and a quick look at it! The Nutriganics Drops of youth aims to keep skin looking youthful, hydrated, enhance skin condition all with 99% ingredients of their natural origin. Doesn't the packaging remind you of their tea tree line? 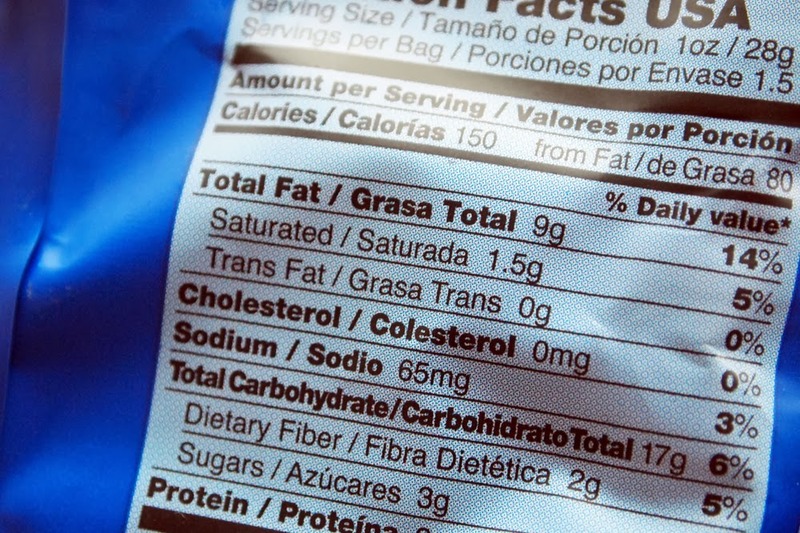 The key ingredient within the product is Criste-Marine. It's the unique plant cell that is known to be able to sustain itself by absorbing nutrients from the sea and high mists. This is what makes it one of the most sought after skin care ingredients of the 21st century. This product contains no parabens, no silicones , so for those who are super conscious about ingredients, this could be a good essence to introduce into your skincare regimen. Anywho, the first thing that intrigued me about it was the pump. 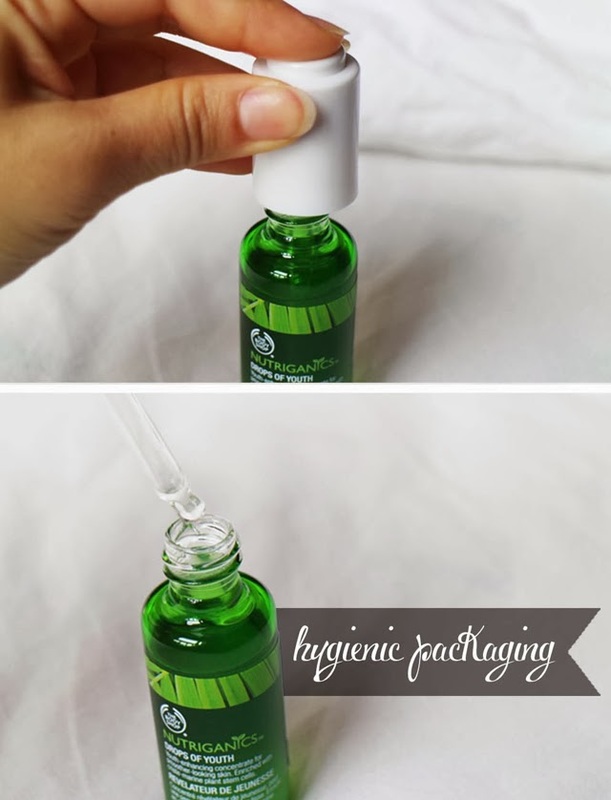 Having the essence being dispensed this way makes it incredibly hygienic, keeping the rest of the essence free from bacteria, so there's a plus. It's known to be great for all skin types, even sensitive skin and is known to absorb really quickly. I've just started introducing it into my skincare regimen and seeing as its only been for 2 days, I'm unable to formulate a proper review as of yet. However I will say that it does leave my skin with a smooth surface right after each use, the smell reminds me of aloe vera gel minus the sticky feel right after. I've taken a before shot of my skin prior to using the Nutriganics Drops of Youth to do a before and after comparison, so I'll be looking forward to seeing/sharing the possible improvements in my skin texture. And so... onto the prize that YOU could possibly be getting! Here are the contents of the goodie bag with a quick description of the products off the body shop page. If everyday cleansers leave your skin feeling tight and dry, this is the product you've been waiting for. It dissolves impurities while soothing and refreshing skin. Super-moisturising Dragon Fruit Lip Butter online or in-store and 100% of the profits will be split across our selected charities. Buy now and enjoy luscious lips and a warm feeling inside. Look good, feel good, do good. Our certified organic range has been created for the first signs of ageing. This innovative concentrate helps to enhance surface skin condition, leaving it looking smoother, fresher and healthier. 1. Follow us on instagram "@samanthashley_"
3. 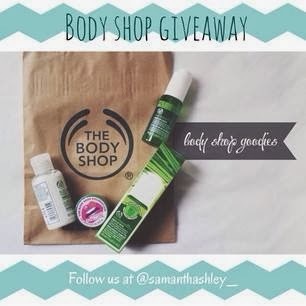 Regram the giveaway photograph onto your instagram page! That is it! The rules are that simple :) This giveaway is opened locally (within Singapore), apologies to our readers who are overseas, we will have a giveaway within the year thats opened internationally for you guys! Being the makeup and skincare junkies that we are, we never fail to walk out of stores with TONES of swatches on the back of our hands and wrists, so we thought it'd be interesting to add a new variation of first impressions post on new products that have been recently released. So we thought we'd take you on our trip to the drugstore to see how things go down. 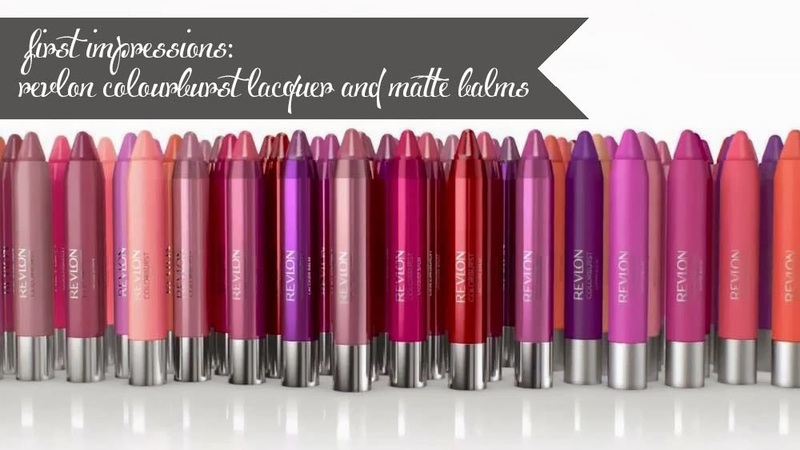 If you've read our post on Revlon's Ultimate Suede lipstick that I purchased Way back in March of 2013 as well as the appearance of the Lip butter in Sam's April favourites and even in our very first post ever that featured the Just bitten kissable balm stains , you'd know that we are both absolutely smitten with the quality that comes with Revlon's lip products. 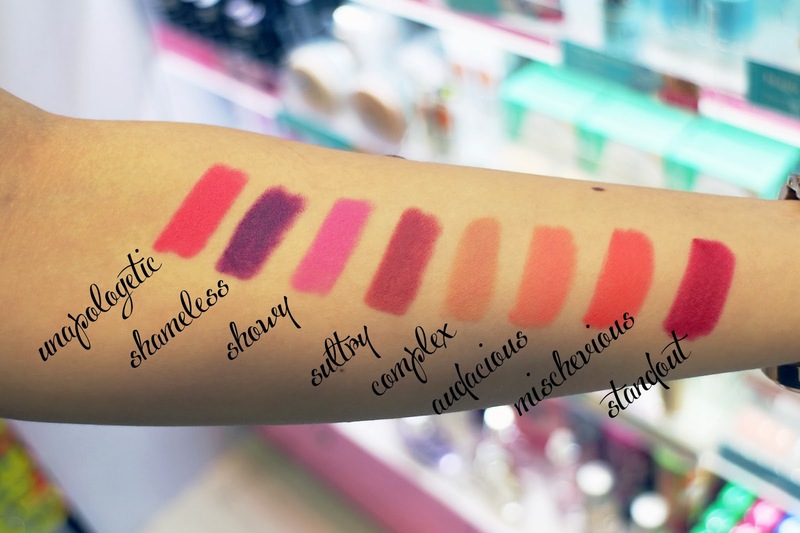 Revlon lip products have a wide range of colours to chose from, majority providing pretty amazing lasting power (with the exception of the lip butter). So we were quite excited to check out the new Colorburst Lacquer & Matte balms that were released in Singapore in early January! So before we get into the details, here's a quick overview on the balms - The balms all come in a chubby stick that has a twist-up function which makes it so much easier having to skip the step of sharpening your lip pencils ever so often. They do have a slightly menthol tingly sensation but is nothing that is too overpowering. They are known to be extremely hydrating and goes on smoothly on its own without an additional layer of lip balm. Perrrrfect for early mornings when we want to skip the additional step ;) Hydration factor aside, we were as overwhelmed with both of these lip products, so here's our first impressions. There is no missing these babies once you hit up the Revlon stands at your local drugstore, they're probably the brightest product on the rack as of right now. The packaging is completely complimentary to the name, and you definitely won't miss it while rummaging through your lip drawer in the morning. 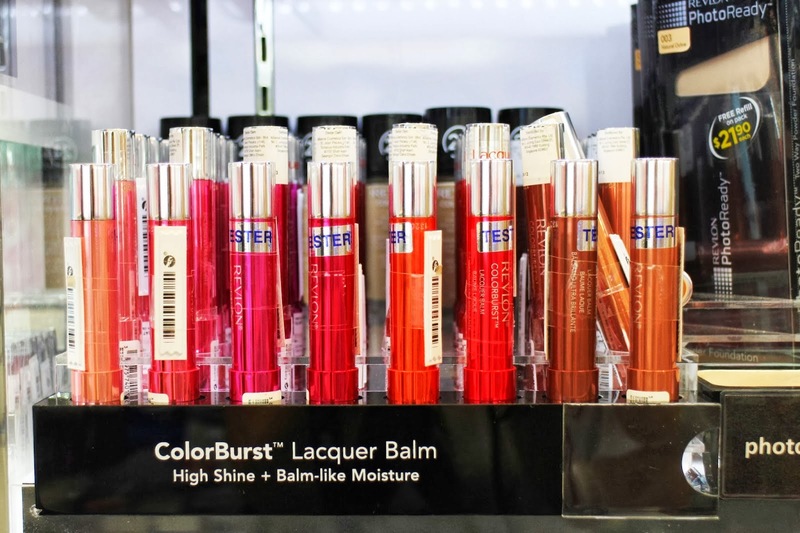 The new ColorBurst™ Lacquer Balm will give your lips a high shine lacquer finish and the attention it deserves. And Triple Butter Complex of Shea, Coconut and Mango butters will nourish, moisturize and soften lips to ensure that your goodnight kiss will be extra sweet! Available in 8 delectable shades. Absolutely amazing selection of colours ranging from corals to nudes to the magentas. Keeping in mind that it is a "High shine" lip product, it doesn't completely cover and conceal the original lip colour that you've got on, but leaves a bit of your natural lip colour peaking through. Whilst swatching these shades we noticed that there was a significant amount of glitter within shade "Whimsical" as compared to the rest. Thanks to Temptalia who posted an incredibly clear shot of the product, we can see that the glitter is incredibly fine and doesn't show up tacky nor chunky. Although its said to last a really long time, this product didn't last as long as it's said to be. The colour looked really natural and super slick on but after a couple hours it faded off completely (Without consumption of food). I was a little disappointed in the lasting power despite the beautiful colour payoff as it definitely does require a couple of re-applications throughout your day. It is however, a good alternative for girls who don't like layering their lip products i.e (lip blam + lip stick + gloss), its a perfect 3 in one item. 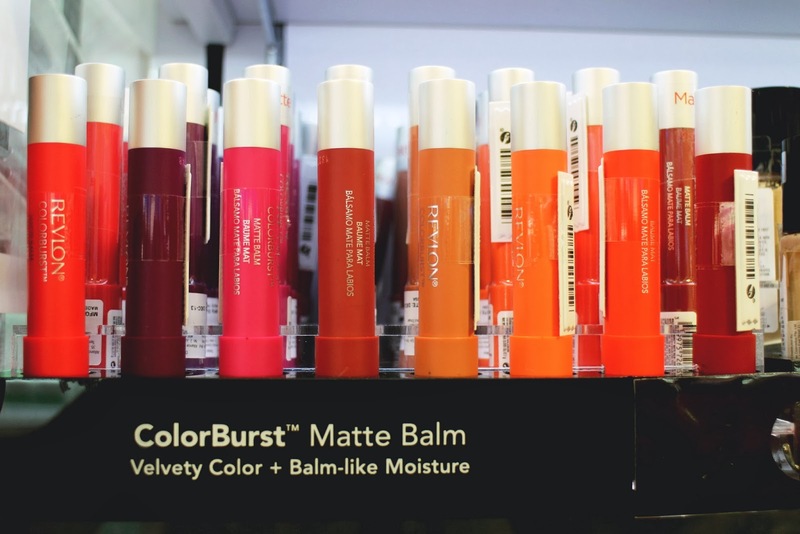 The new ColorBurst™ Matte Balm will give you a velvety Matte look. Moisture rich balm, A matte finish thats beyond plush. Balm that's beyond comforting. Our triple butter complex of shea, Coconut and Mango butters nourishes your lips. Avaliable in 10 collectible, craveable colours. I'll be completely honest, I felt that the shade was a little too bold for my liking because I don't usually wear bright colours. The pigmentation is awesome, and even after wiping off the product later on, it left a pretty heavy red stain on my lips that lasted for at least 2/3 hours. The application process was a breeze - It's a little different from the matte lip tints that brands like NYX has to offer because it doesn't sit on your lips as a layer but you do feel that it does sink into your lips without over-drying them out. The shea butter that's present in the balm also prevents it from settling into the cracks/ creases of your lips. For anyone who's wondering, the menthol feel faded about 5/ 10 mins after application. 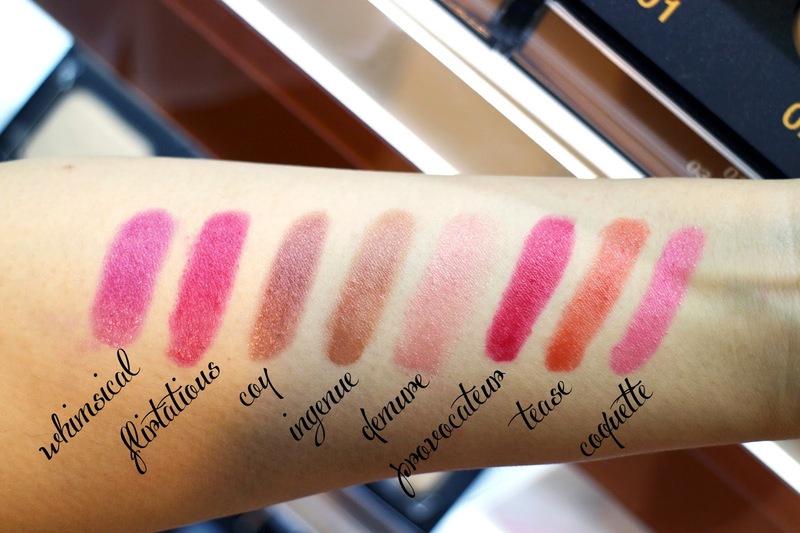 Ladies who are looking for perhaps a drugstore alternative of the NARS lip pencils. If you do enjoy reading these types of first impression posts, do let us know and we'll be sure to have more of these on our blog. We hope you are having a lovely start to your week!! Have you tried them out? We hope you are having a lovely day/afternoon/ evening! 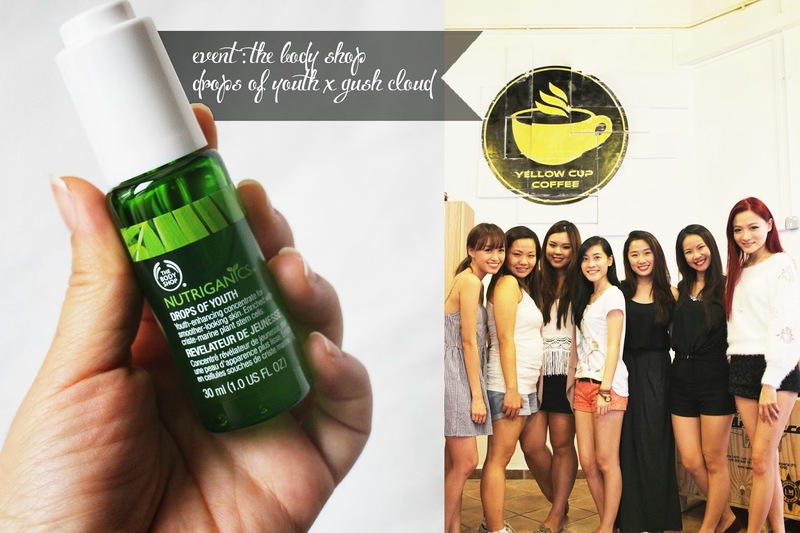 So just recently we got to attend The body shop's Drops of youth event hosted by Gushcloud and to sum it up, it one of the best days that we've had in the year so far! 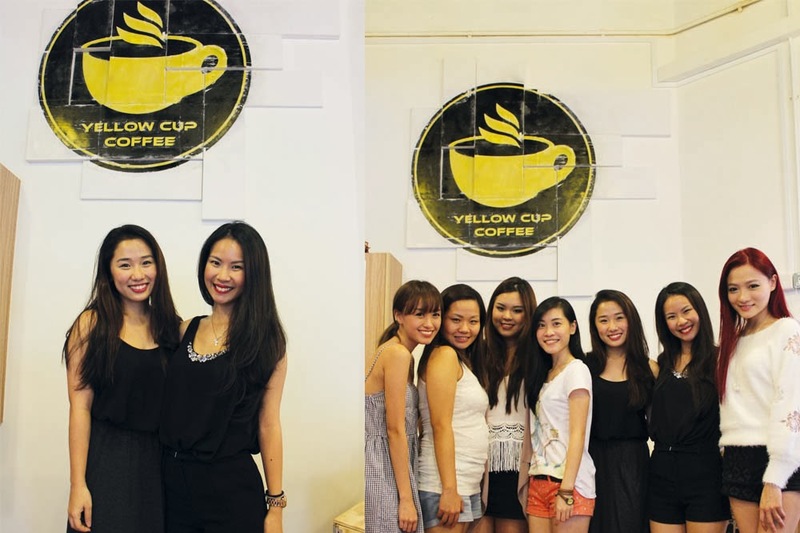 We were super thrilled that we'd get to be meeting one of our favourite beauty blogger / youtuber / makeup artist of all time, Roseanne Tang. We literally had one of those girly-squealing "OMG OMG OMG, IS THIS FOR REAL?! " moments when we received the email that we'd get the chance to meet her and it goes without saying that we had a smile plastered on our face for the rest of the day. Our day started off at Amore Fitness to promote a healthy lifestyle that the body shop embraces within their drops of youth serum. 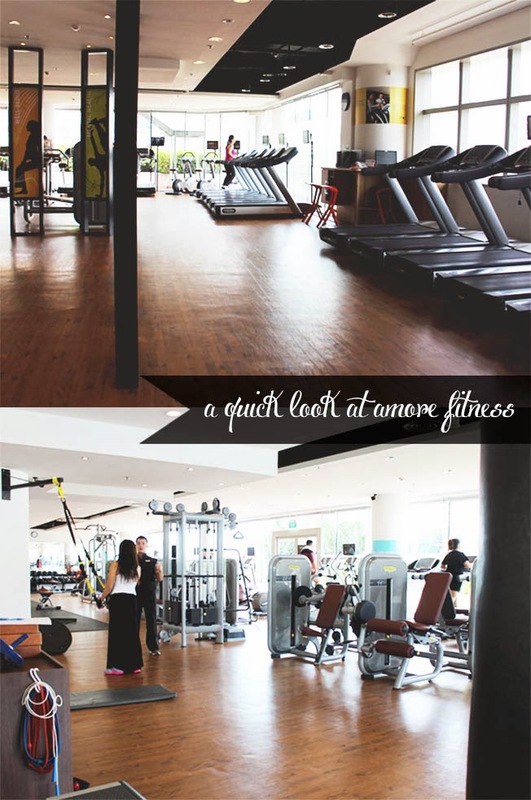 Lately we've been gym and health nuts and were super excited to see what they had in store for us. 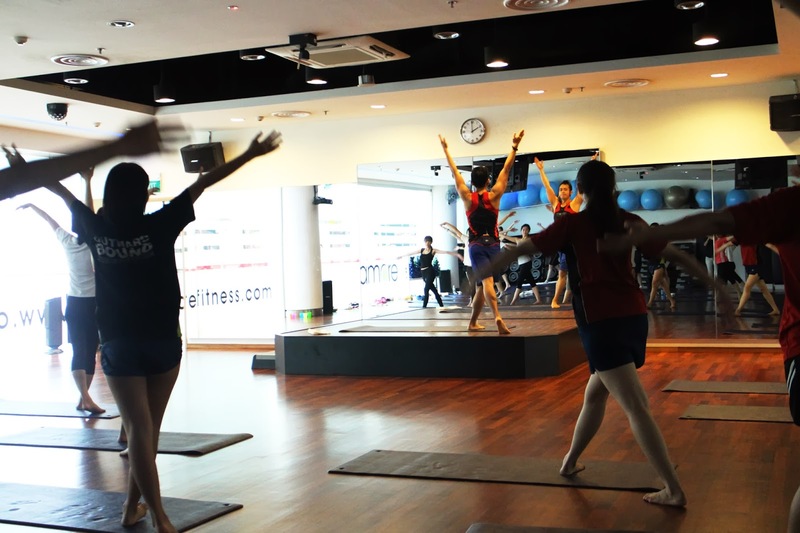 "Amore Fitness is Singapore's leading fitness and spa service provider committed to promoting and encouraging members of the public to attain a healthier lifestyle through a holistic approach to fitness and well-being." We all got attend a Kick-boxing, Zumba & Stretch-fit class all put into one. 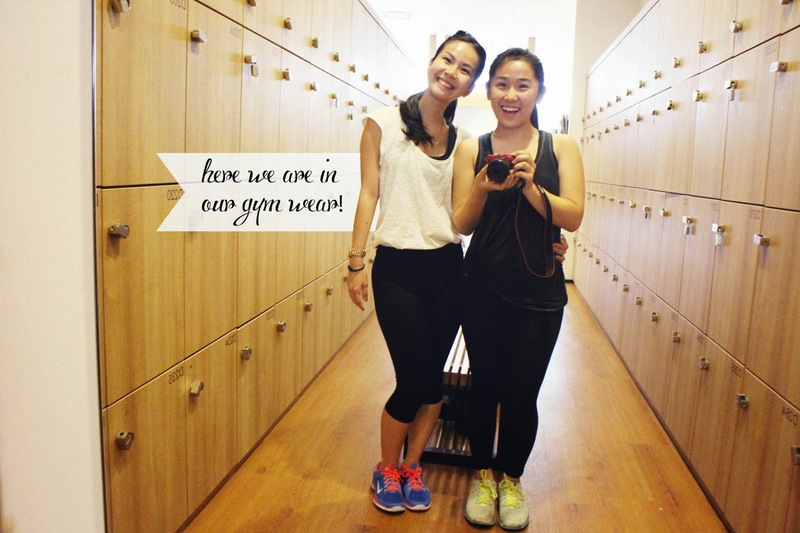 We didn't have much time to take a photograph of our post-work out state but here's a our pre-work out OOTD. If you follow us over on our instagram page (@samanthashley_), you'd probaby have seen quite a number of photographs of us at zumba, pilates or yoga . There's just something about working out in classes together, it keeps you motivated and you'll be surprised how fast time goes by when you're in a class. I have Sam to thank for getting me into it! Zumba and Kick-boxing is a great way to work up a sweat, and I kid you not, 30 minutes into the workout, we had sweat beads rolling off our faces and our cheeks were flushed red. As we were all incredibly active, I did not manage to take a photograph of us doing Zumba / Kick-boxing (Though I'm sure it would be a blur due to the pace we were all moving at) , but here are some photographs of us doing Stretch-fit! 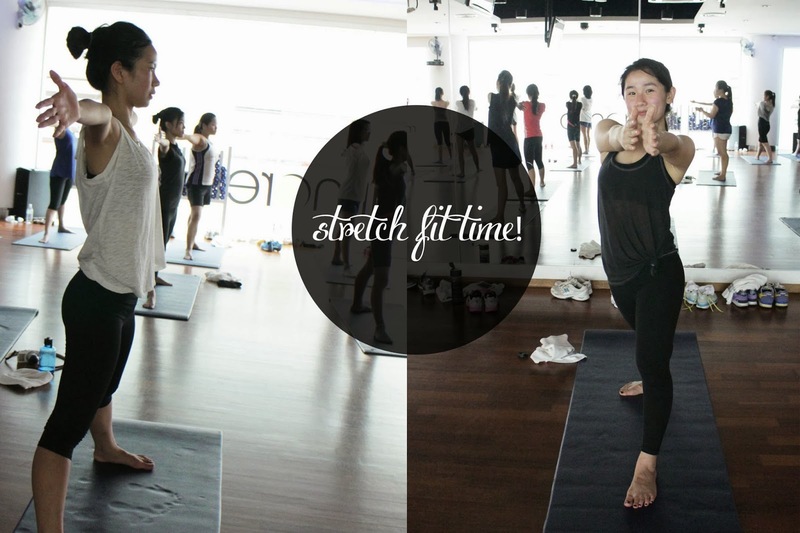 Stretch-fit is a new class that's combination of Pilates & Yoga, the perfect way to wind down or to build balance after an incredibly active 40 minutes filled with side-sweeping, throwing punches and moving our bodies to the beat earlier on. There's was something about stretching out our muscles, being able to clear our mind and focus on our breathing that really soothes a person. Above shows one of the many stretches that we performed to unwind from our crazy cardio session. All sweaty and flushed, here's a group photograph of all the bloggers & readers that attened the entire event! 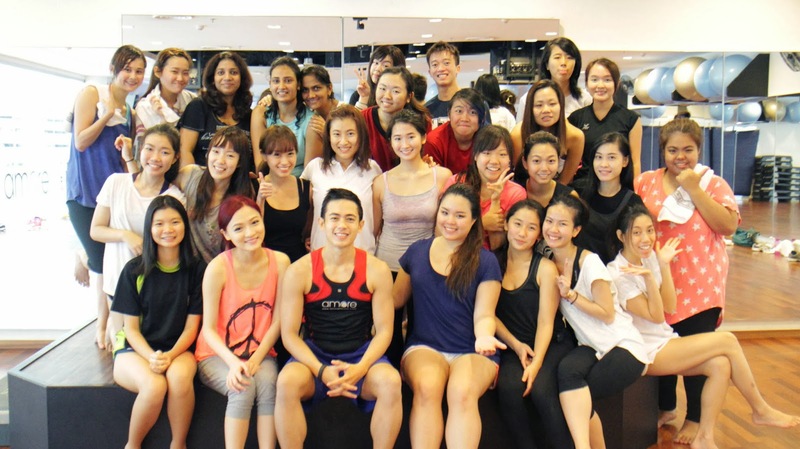 Thank you to Amore fitness and our enthusiastic instructor for a really amazing class. The torte's (A denser version of a your typical muffin) they had to offer came in all sorts of flavours, In order, Apple, chocolate, banana and ginger bread which was a hot favourite at our table. Of course, we had to try their latte's! 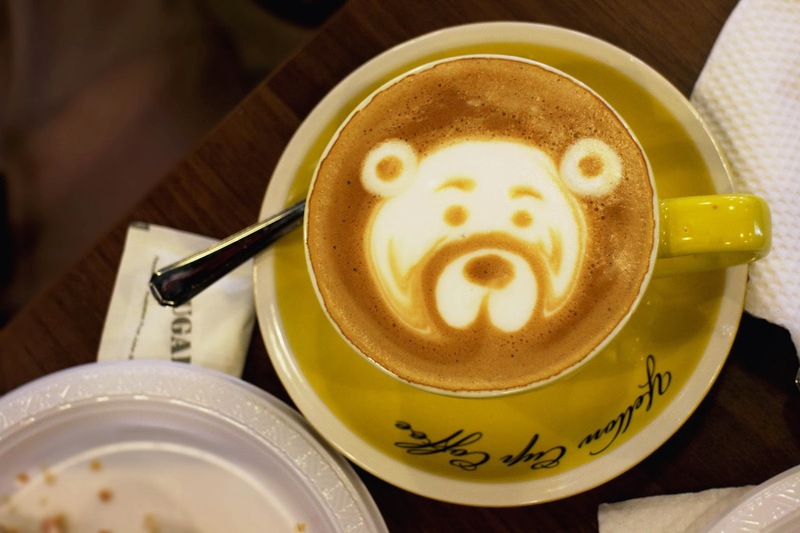 Doesn't the latte art in Roseanne's drink look like Ted?! If you've seen several other's blogger's photographs of their latte's you'll know we all got different latte art's in our drinks which were super neat. If I'm not wrong, there was even a latte art of a peacock in Shine's latte! Here we are with the lovely and bubbly, Roseanne Tang. We were starstruck and it was hard to believe that we'd just spent a day with her. We've been reading her blog/ youtube for a really long time and would never have imagined that years down the line we'd get to meet her and hang out with her like we did today. 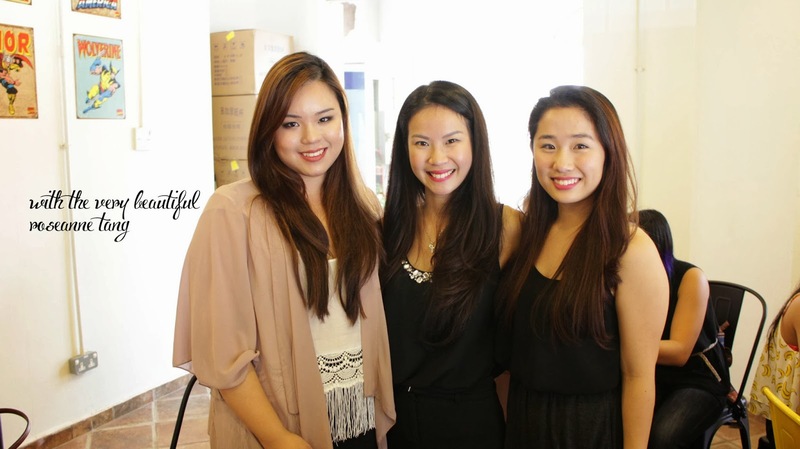 We also got to meet fellow beauty bloggers Michelle & Zoe! We had such a lovely time talking about all sorts of things, skincare, food , youtube and it always feels amazing to have this instant chemistry with people who share the same interest as we do. 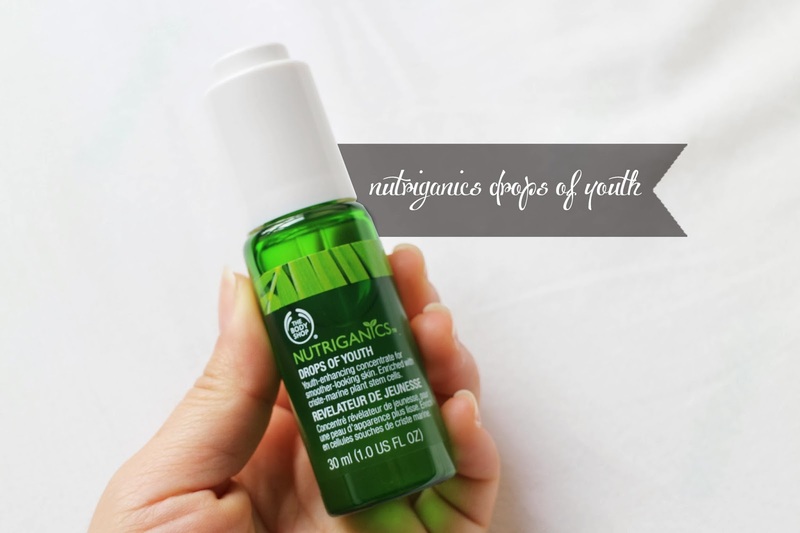 On to the main event, the introduction of Body Shop's Nutriganics Drops of Youth. This is no new product to the body shop family and in fact, its ranked as one of the Best beauty buys of 2013 by women's weekly. This innovative serum cotains criste-marine which is known to ehance surface skin renewal. A key ingredient in the Drops of youth, criste-marine, is the unique plant cell that is known to be able to sustain itself by absorbing nutrients from the sea and high mists. This is what makes it one of the most sought after skin care ingredients of the 21st century. We also received a goodie bag with some body shop treats, amore fitness passes and of course the Nutriganics Drops of youth! cannot wait to give this a try and let you guys know more how it fairs in a review post in about a week or so ! *fingers crossed* it works out well! We had such a lovely day out meeting the Gushcloud bloggers and making new friends! Everyone was super friendly and words honestly cannot truly describe how much fun we had today. 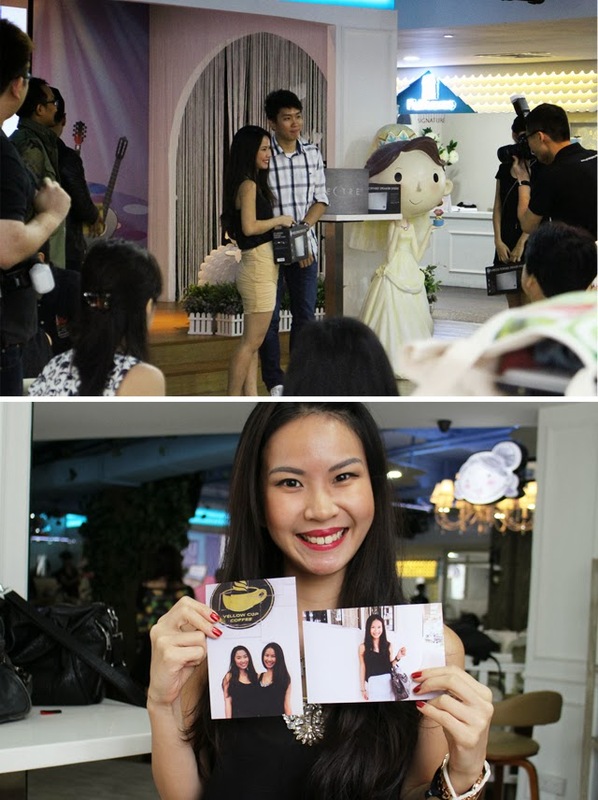 A huge thank you goes out to Roseanne for giving us this opportunity and to Gushcloud and The Body Shop Singapore for organising an incredibly fun packed day!